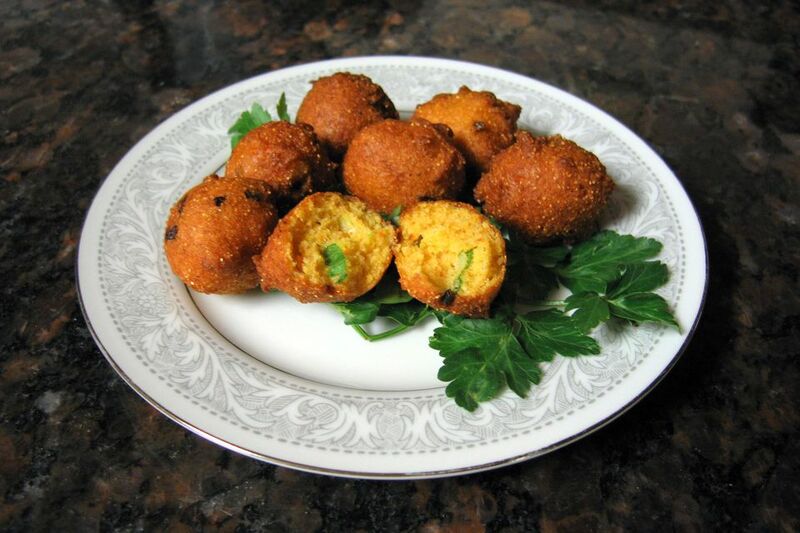 These hush puppies are made with self-rising cornmeal mix, along with sweet milk and finely chopped green onion. The origin of the term "hush puppy" is unclear, though there is a popular story. Purportedly, after the Civil War, cooks would toss bits of cornmeal batter to dogs, saying, "Hush, puppies!" Another account claims they were named "hush" puppies because people would not want their neighbors to know they were eating such a humble food. These delightful fried cornmeal dumplings are traditionally served with fried catfish. These beer batter hush puppies with jalapeno peppers are a great jazzed-up alternative. In a deep fryer or heavy, deep skillet, heat 2 to 3 inches of oil over to 370 F.
In a mixing bowl, combine the self-rising cornmeal mix, flour, and onion. Add milk and egg; mix well. Let the batter stand at room temperature for 5 minutes. Drop batter by tablespoons into the hot oil. Fry the hush puppies in small batches until golden brown, turning several times to brown evenly. Heat the oven to 200 F before you begin. Put fried and drained hush puppies on a rack and place them in the preheated oven to keep warm while making subsequent batches. For softer hush puppies, use 1 3/4 cups of self-rising cornmeal mix and 1/2 cup of self-rising flour. Add about 1/2 cup to 1 cup of corn kernels to the batter. Replace the green onion with 1 tablespoon of grated onion or 1 tablespoon of chopped fresh chives. Sweeten the hush puppies a bit with a few tablespoons of granulated sugar.